The old years went – in as little a time as it takes to turn around and see who is tapping you on your shoulder. And it is the new, the next year. I hope it will pass too – in as little time as it takes for me to turn my head and look forward again – because the face of 2017 doesn’t look good or kind to me. Neither do the next ten or so years. Beyond that the world will become a better place. If, that is, if we survive and don’t destroy it all. It is actually already becoming a better place! The thing that has too pass – or pass away – is the United States Empire. In a few years it will go the way Rome and all the rest plus the Ottoman, British and Soviet empires did. No empire lasts forever. The indicators, the cracks, in the Empire are there for all to see – the Americans and other Westerners will be the last and remain in denial for some time until the discrepancy between the self-image and the reality, the self-delusion, has grown too big. Like East Germany or Russia at in the early 1980s. • All wars lost since Vietnam, human and economic costs to the US itself tremendous, beyond imagination. • Ever deeper income differences known to be harmful to any society. • About 20% of the people living under the poverty line. • Ghettoisation, dilapidated cities and infrastructure. • Loss of hope and positive vision – so much social anger. • Loss of credibility and legitimacy in the eyes of the rest of the world – oh, remember the 1950s and 1960s! • Repeated violations of the UN Charter and international law with the excuse of being “exceptionalist” – standing over and above the law, beyond everybody else. • By any statistics the most killing country with the most interventions, occupations, regime changes and arms exports to all corners, 600+ military facilities in 130+ countries, special assassination troops in as many, drone warfare and the Global War on Terror that has increased terrorism 80 times since 9/11 2001. Obviously a system that can neither survive in the long run nor remain loved by the world. Too many wounds, too many traumas in its wake. And no apologies. • The soap opera-, reality show-like presidential campaign that documents that while good candidates for the US and the world were available – Jill Stein in particular – the two main competitors should carry names like Pest and Cholera – most people voting on one to avoid the other. But now enthusiasm whatsoever. A morally corrupted political system in which only material issues and things below the belt was debated; economically corrupt politics in which you can get nowhere unless you are a multi-billionaire or let yourself being bought by some. • As an Empire, the US has been teaching people and countries lessons over 7 decades. It’s consumed itself – because # 1 in a system never learns. It teaches, only. The pupils have tired – in Asia, in the Middle East, in Russia, in Africa and, long ago, in South America. How tragic! The US could have promoted the Beloved Community à la Martin Luther King at the global level. Been the world power for good. If anybody could, it was the one. • Obama – in spite of the good that may be said about him – has been conducting war in more days than any other president in the history of the US- while president Eisenhower in his farewell speech in January 1961 warned that the Military-Industrial Complex could devastate the republic if not brought under tight democratic control. It is that complex which has gained strength ever since and become the Military-Industrial-Media-Academic Complex – MIMAC – that has won the battle about America’s destiny, not the Beloved Community. The confrontational bullying, the violence and the war have won, not the benign power, not the trust, common good and peace. Now it’s the time for the US to learn and become a benevolent republic, a strong innovative society without the self-inflicted burden of being Master of everybody’s destiny but only that of the Americans. What a relief it will be for them and for the rest of us. The essential future question: How will the US Empire dissolve? Regrettably, the West has no Gorbachev – an innovator and visionary with an ethics of cooperation and doing good. We have one decent, principled – but despised – leader, Angela Merkel. And she is not at the level of a Willy Brandt, Bruno Kreisky, Uhro Kekkonen, Olof Palme or whatever great personality some of us have witnessed. Without it being an analogy but: What would Hitler have done there in his bunker when he recognised that his Empire was over, had he had nuclear weapons and a button to press? Gorbachev presided over the least violent dissolution of an empire with its Warsaw Pact. Who can do the same for the Western Empire – the US, and with it, NATO? Too hard a question to even raise, perhaps? In the extreme best of cases, Donald Trump will focus on the republic and on making that great again. That would be great for the Americans and for us – all of us who were never anti-American but anti-Empire. A benign interpretation would be that he is critical to Empire-maintenance and will fight fewer hopeless and self-destructive battles abroad. That will be good – and something one could not reasonably expect of a neo-conservative, interventionist hawk by the name of Hillary Clinton and her husband back in the White House corridors, one of the most belligerent presidents in modern times but charming it away. Whaat? Yes, he ignored all promises made to Gorbachev to not expand NATO “an inch” and thus sowed the seeds of the Ukraine crisis today; he bombed in Afghanistan, Iraq, Bosnia, Kosovo, Serbia and Sudan, upheld – with Madeleine Albright’s historic defence – the sanctions on Iraq after 500,000 innocent Iraqis were known to have died. And he had no problems letting his ambassador to Croatia, Peter Galbraith, mastermind the ethnic cleansing of the Croatian Serbs out of Croatia in 1995. So, the next ten or so years are going to be interesting in the Chinese sense of that word. Forget about extrapolating the future from the past, forget about order and common sense. Most things under the sky will have to get worse before citizens and – new – leaders take sufficient action in sufficiently many countries to make the world a better place. But hey – over the clouds, the sky is always blue – as any flight passenger knows. 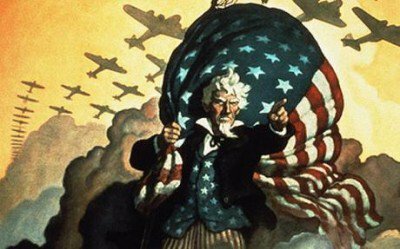 • The US Empire will be the last – no country or culture in its right mind will try to influence or rule the whole world – and, if so, surely not through full-spectrum dominance and predominantly military means. • We’ll see a multi-polar world emerge – a world where citizens will connect ever more and criss-crossing, in which the nation state, nationalism and national party-based parliaments will disappear and a new global democracy will emerge. Co-operative structures all over – a passion for the common good and not for only “me and my good”. • The vertical world order will change to horizontalism spearheaded first of all by the new Silk Road and Silk Belt projects from China through Asia, to the Middle East, the Balkans (Serbia and Greece, not the EU), all of Africa and, eventually, over to South America. Through infrastructure building – fast transport and communication – it will link the new world through cultural and business projects and bring people in touch about cooperation and common building – not split them in warfare and making send thousands of refugees running for asylum. That’s one of the most visionary – if not the only – ideas encompassing and touching a large majority of the world and doing so for the common good. Cellist Yo-Yo Ma has already done the new Silk Road Project – connecting people through the arts to increase global understanding. Much more will come – culture in a broad sense becoming as important as economics. • Of course the Middle East – freed from the Sykes-Picot policies one hundred years ago (1916) will thrive as a new economic community with all it has in common. Instead of fighting about, say, water resources it will build its own Islamic economies, trade and prosper. Of course, again, they have more in common to build on than what separates them. Iran will become the new Switzerland of the Middle East – the one who is different, helpful to the world and becomes a mediator and meeting place. Why should everybody go to Geneva and only there, a foreign place to most? And oh, left to themselves and freed from Western divide-and-rule, the Muslim nation will build bridges between Shia and Sunni – and turn against those, like Daesh/ISIS, who are only misusing religion for political purposes. And Kazakhstan with its consistent peace-with-neighbours policies and having freed itself of all old nukes, will – in spite of being old-fashioned authoritarian in its leadership – remain and grow as a meeting place. • We’ll move away from the post-literate, marketing-based and simplifying media and education system that has developed the last 20 or so years with far too much disconnected information, less and less emphasis on comprehensive knowledge and never reaching the level of wisdom. • The world will harness the best of new connectivity, communicate and collaborate more across all old lines – no more walls! We’ll learn and interact on the Internet and tablets, all cell phones will be sold with educational apps – including an app with the basic principles of nonviolence peace-making. Most likely human creativity will explode worldwide when schools are de-schooled, universities become multi-versities and human creativity is set free from all old “correct” ways of thinking. Authoritarian states and fake or pseudo democracies: Watch the writing on the wall! • Will there still be war and violence when I turn 100? Probably yes – like there will be diseases too. But much less – because we have switched balanced. It will no longer be a world in which the UN has US$ 30 billion to work with and the military US $ 2000 billion. Thanks to the global crisis, humanity will have recognised that the opposite proportions are much better for us all. It simple ethics and empathy in one. And if we can’t make that change, ask yourself whether we deserve to survive as species. • The values will change too – Christian values will be there but no longer in its missionary mode but much more in a world that blends Islam’s peace philosophy, Buddhism, Hinduism, Daoism, Quakerism and the non-violent, stronger sides of all religions coming together – eucumenism and Gandhian eclecticism. Theocratic states will disappear. • The last and obvious need is to replace the repairing evil society with the preventive good society. We do all the wrong things and then have to repair the damage instead of abstaining from at least some of that wrongdoing in the first place. We fight wars as the first option instead of trying peaceful means first; then we have to re-build destroyed societies (Mostar or Aleppo will not be the same after such a re-building, it will be a replica only). We kill people and then have to go through all the inner pain, punishment and – generation long reconciliation and forgiveness processes and other healing. And always fear that the things we did will be remembered, create traumas and or wish for revenge? Wouldn’t it simply be easier to not kill in the first place – for instance talk? And we harm people and whole societies and then some of them turn up at our door as asylum seekers? What do we do? We slam the door and not only behave in an inhuman selfish way, we also show the rest of the world that we are brutes rather than helpers. If we want to lower the ever increasing figures for refugees and internally displaced people, we just stop wars, killing and destruction and the rest will be migrants, not refugees. We extract resources, produce and consume in ways that are absolutely non-sustainable in the long run – and we have known it since world future reports were written in the 1970s. Then we have to invent a huge new re-cycling industry and try to repair nature in the same tempo as we destroy it – which isn’t possible with an eternal material growth philosophy. As Danish philosopher and novelist Villy Sørensen once shall have said: “There are no limits to quality but there are always limits to quantity.” Is that really so difficult to comprehend? This philosophy will also lead to an ever increasing number of environmental refugees. At some point – we are far from there – the whole things becomes unbearable and conflicts will blow up – not because of the refugees per se but because of our short-sighted brutal policies. Just think of the many consequences you action may have before you act – and much harm could be avoided and more happiness and cooperation develop. We eat and drink and smoke in ways that are unhealthy and then have to get repaired – or we die early. What about preventing diseases while you sit at the table and take a walk afterwards? To move from the evil repair society to the prevention and happy society could be called smart living. It would be a key to reducing most of all the types of violence – the consequences of which we are battling in these dark times. Spend your new year in developing your hopes and visions. On being forsomething and don’t accept the rampant fearology practised on you in these times. We are in crisis, deep crisis, yes – but it isn’t hopeless yet. Happy new – visionary – year!